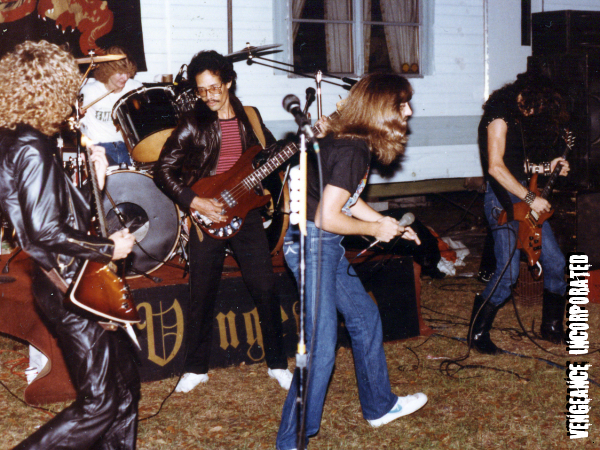 Terrible recording made from a boom-box cassette player on a low-bias cassette at the Turkey Creek party where the pics above were taken, but it gives you the idea. 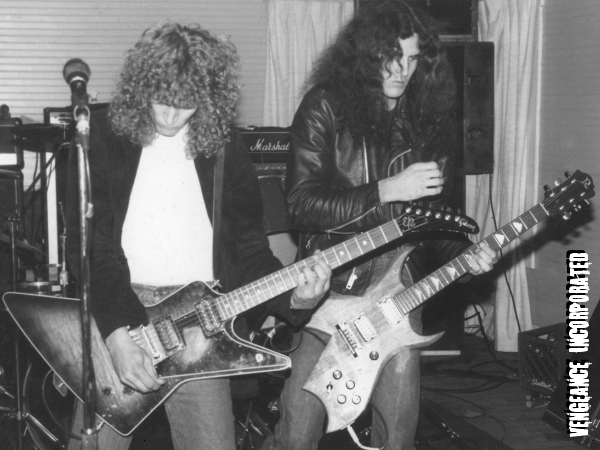 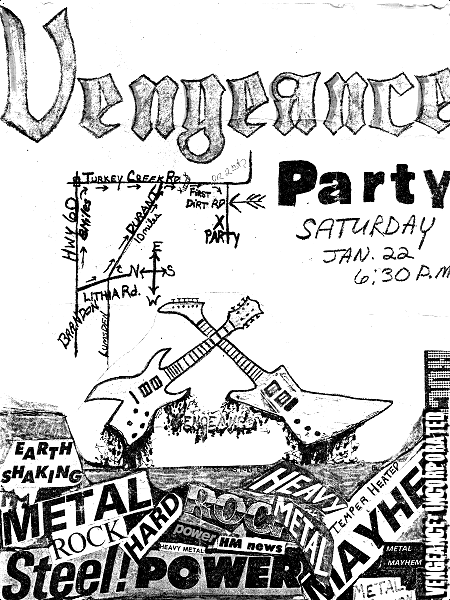 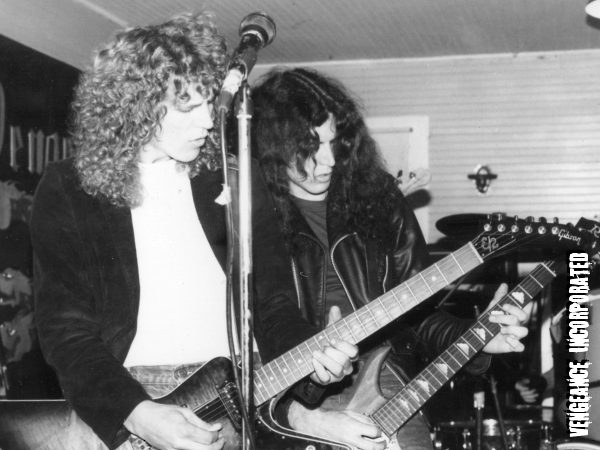 The other mp3 is part of a song that Curt and Dave’s band Rapid Fire played at a party where they shared the bill with Vengeance a few months before Dave joined Vengeance. 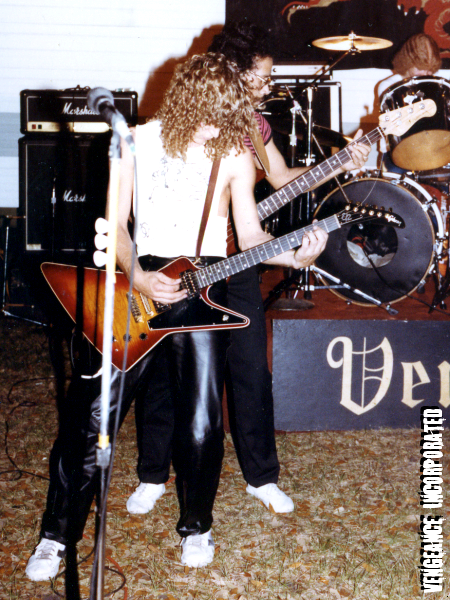 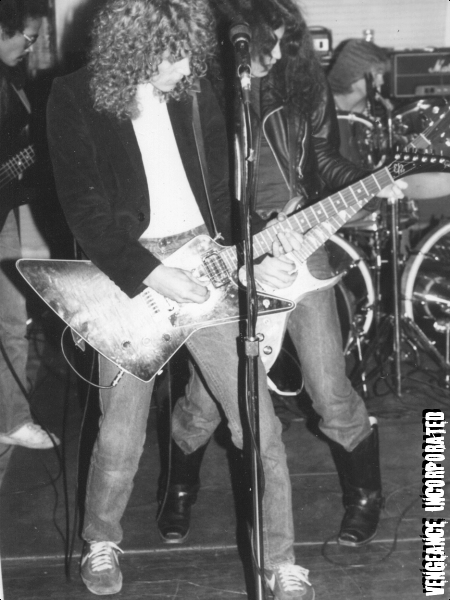 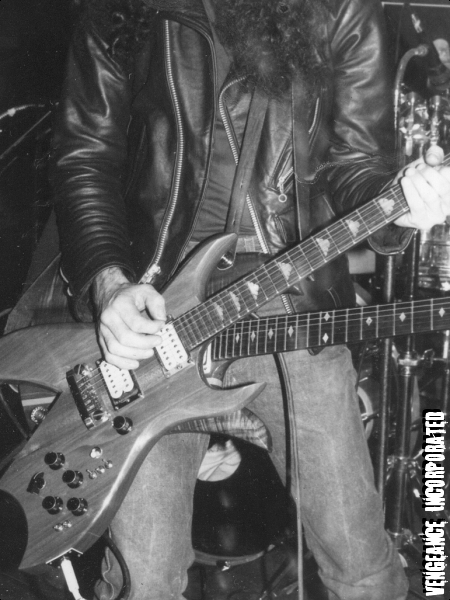 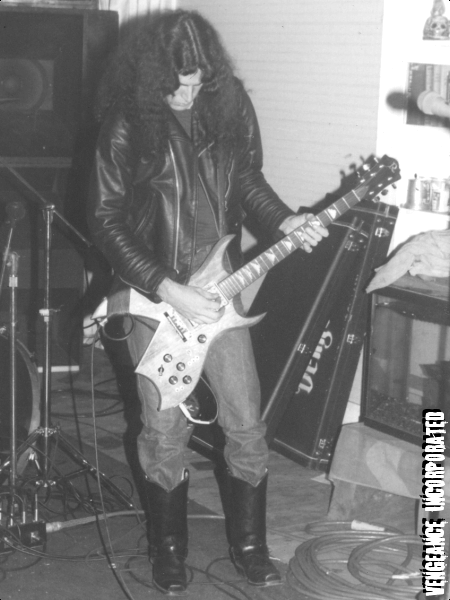 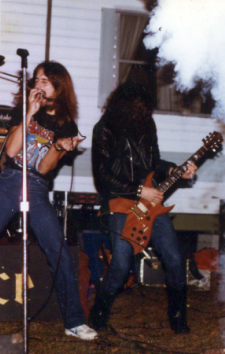 Curt joined a few more months after that, and for a short time Guy, Curt and Dave were Vengeance, writing and recording songs like Predator, HMSQ and Cry Havoc before Dave left to join Brat. 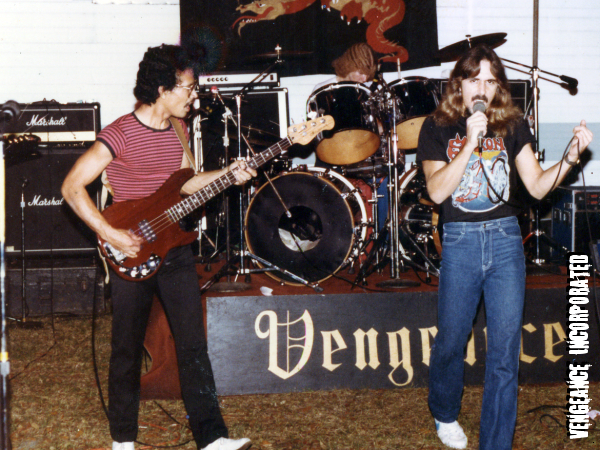 After an unsatisfying stint playing the new material, the band underwent a radical shift. 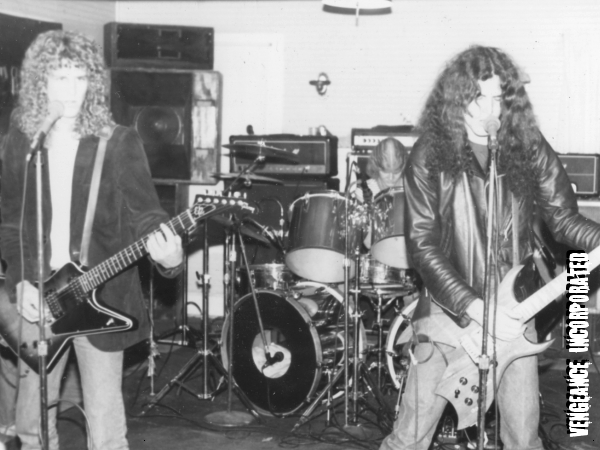 The Mark III line-up had not been a happy one, and there were a lot of hard feelings and animosity that led to almost all the members of that line-up leaving the band except Guy and Dave. 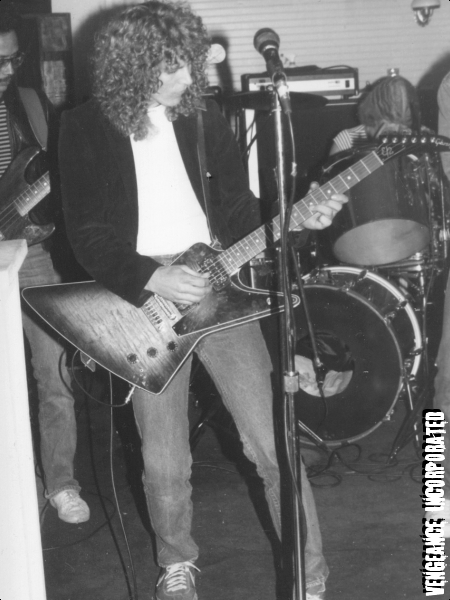 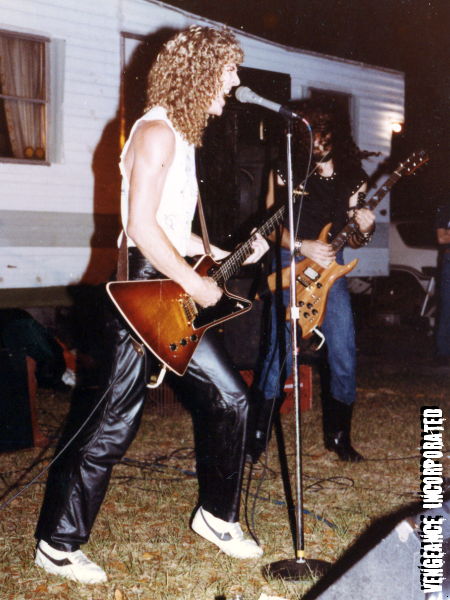 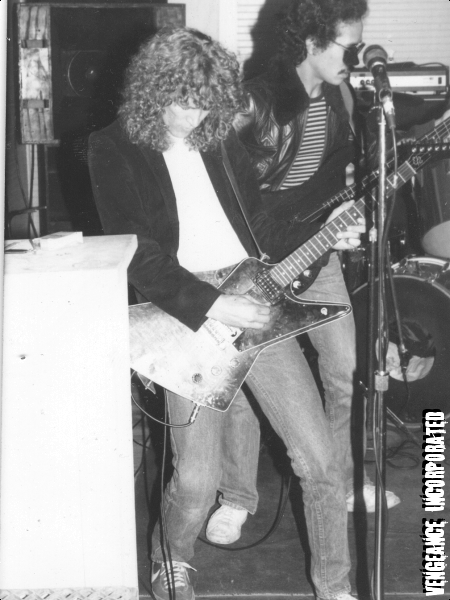 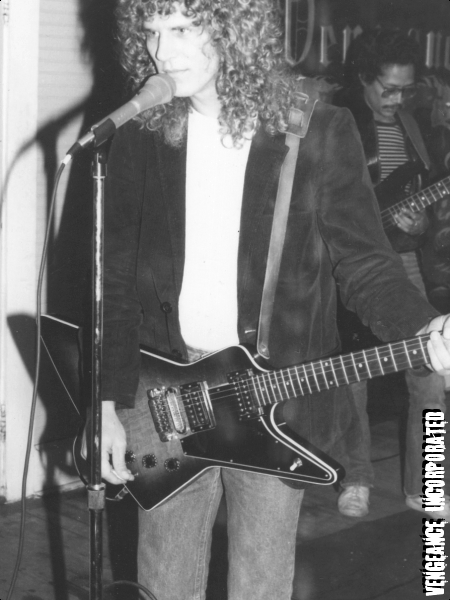 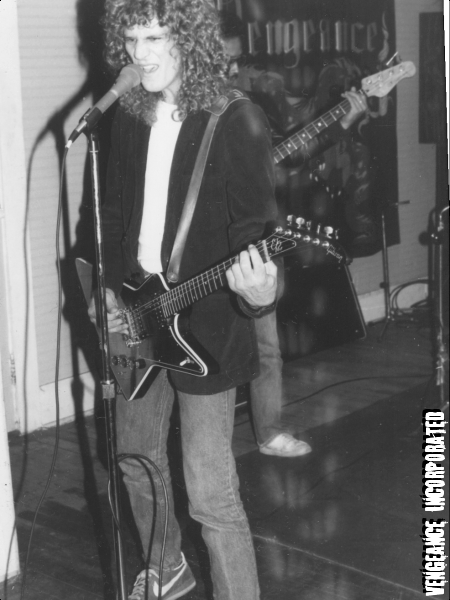 First, long-time co-lead guitarist Mike left and was replaced by Curt, Dave’s brother. 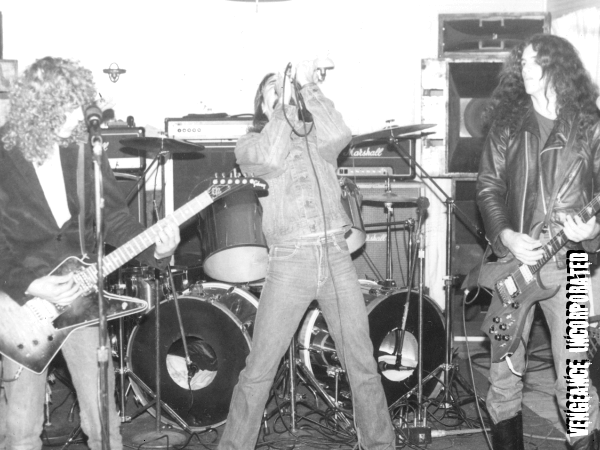 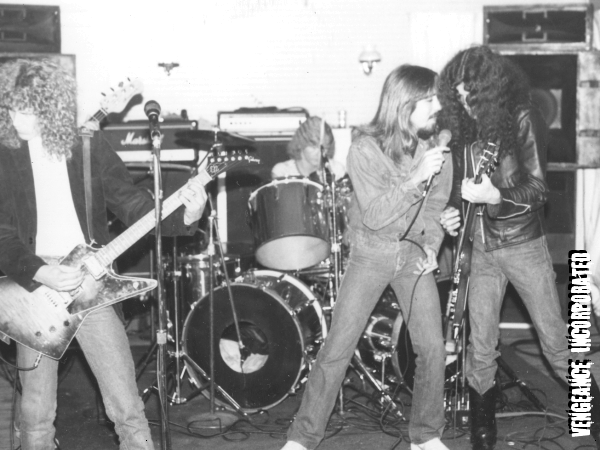 Less than a year later, first Herb and then Wayne left, mostly over personal clashes, but there were gigs scheduled, so Guy shifted first to bass and then took over lead vocals, and Vengeance became a power trio. 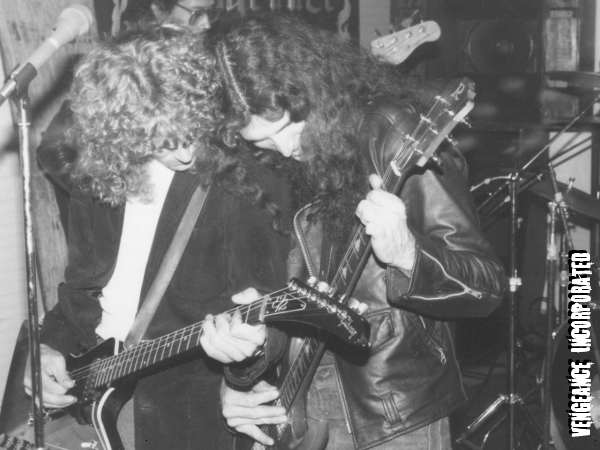 They decided to concentrate on writing and recording originals and played very few live gigs with the line-up of Guy and brothers Dave and Curt. 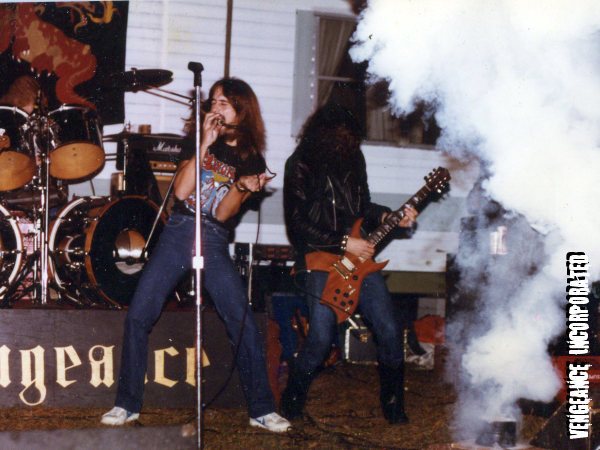 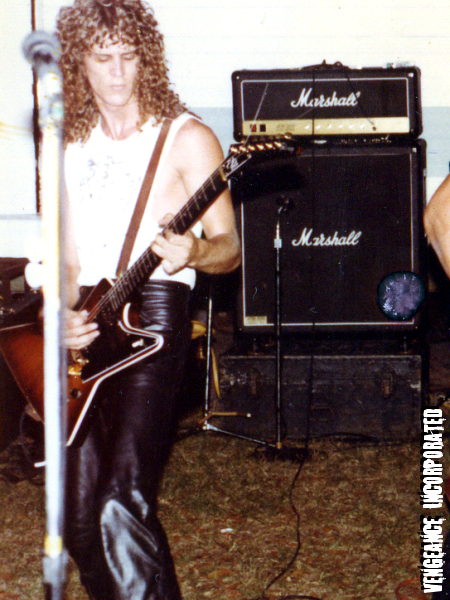 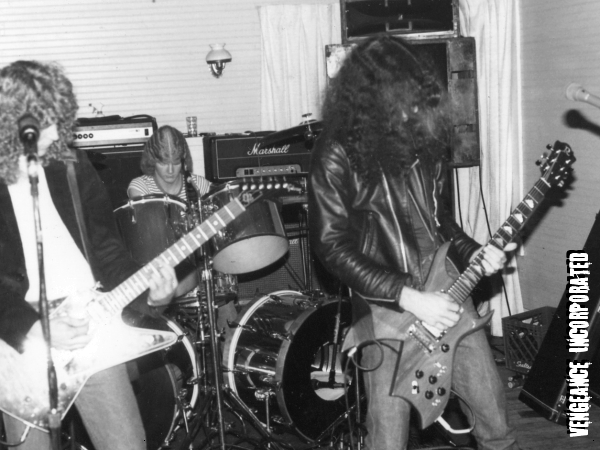 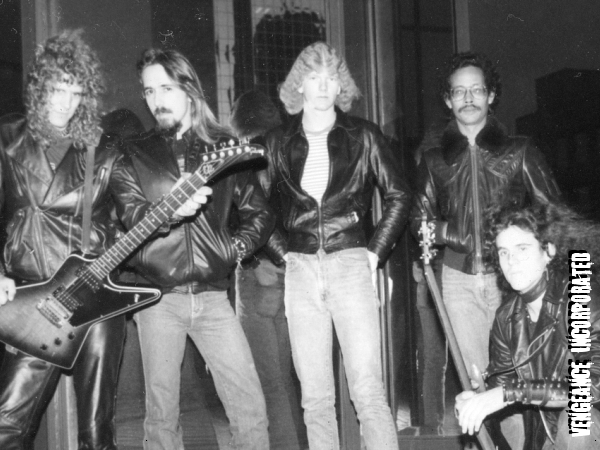 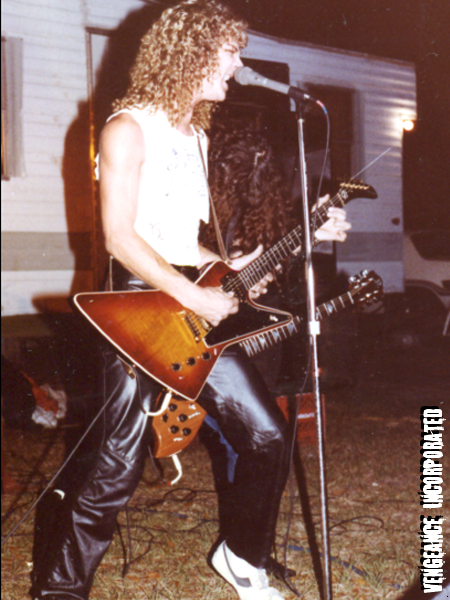 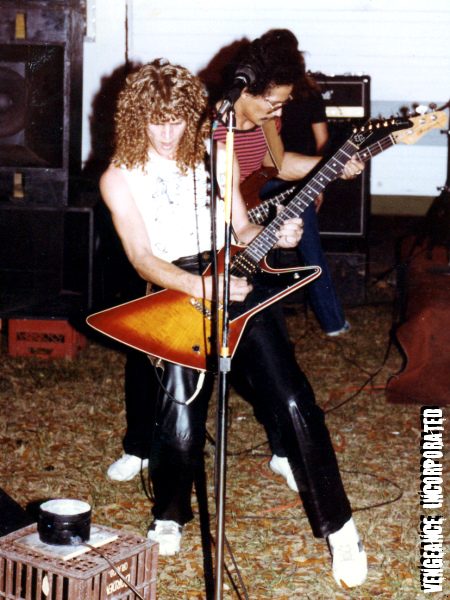 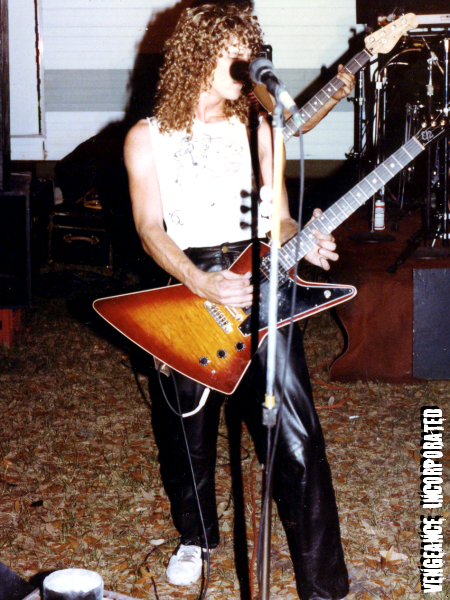 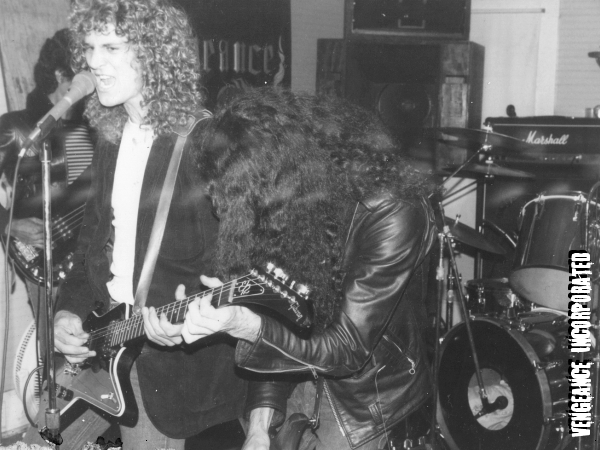 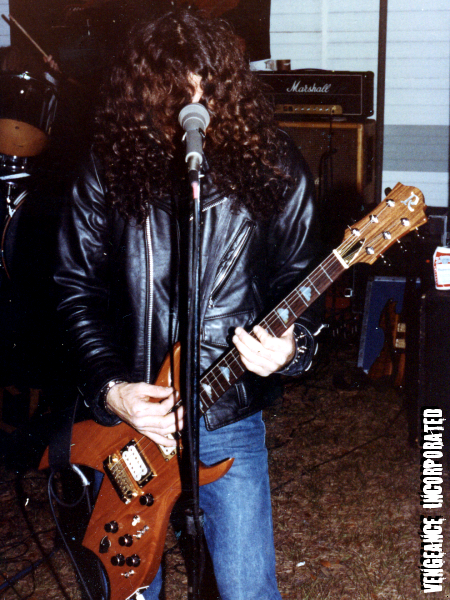 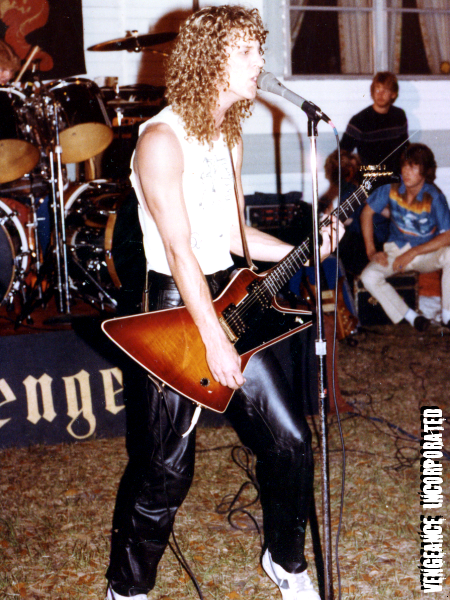 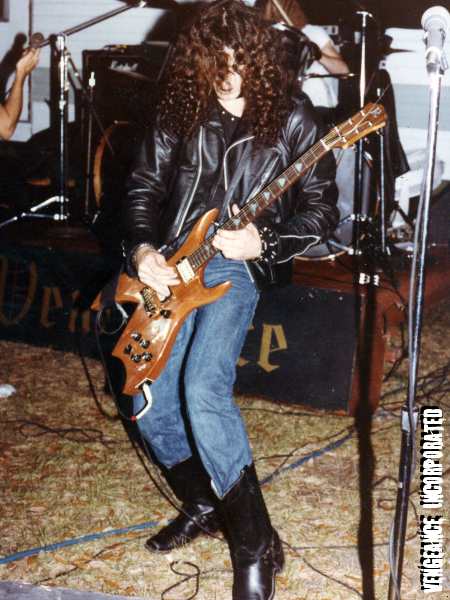 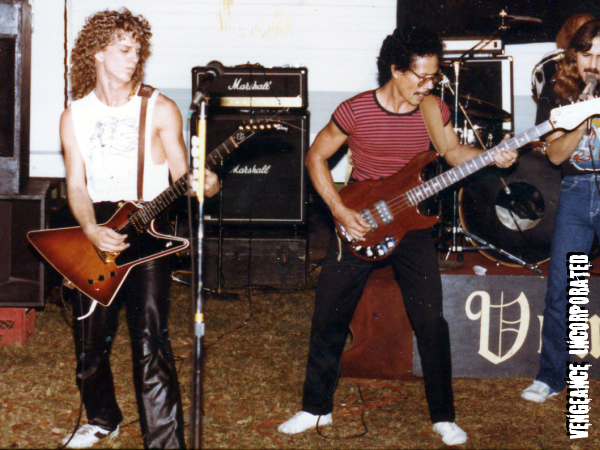 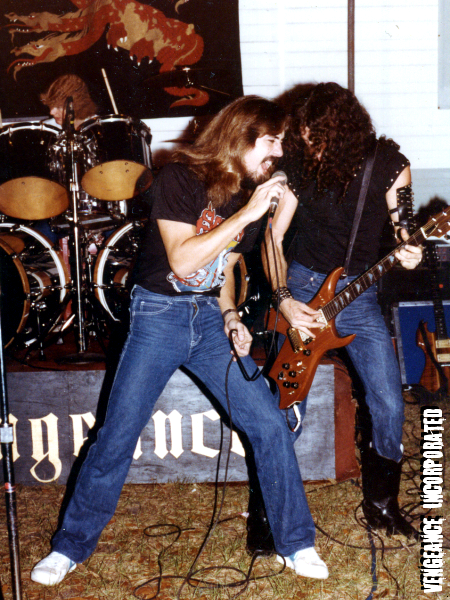 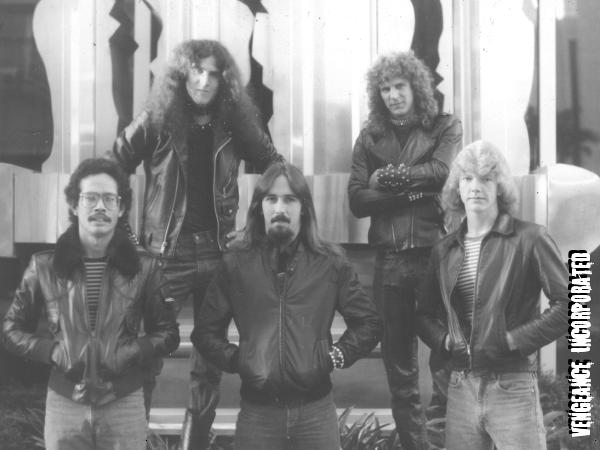 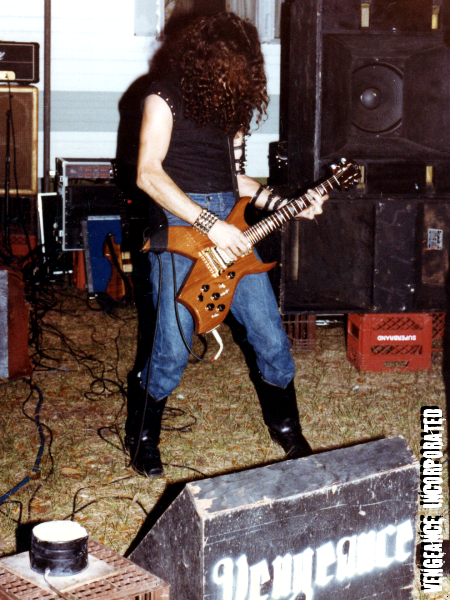 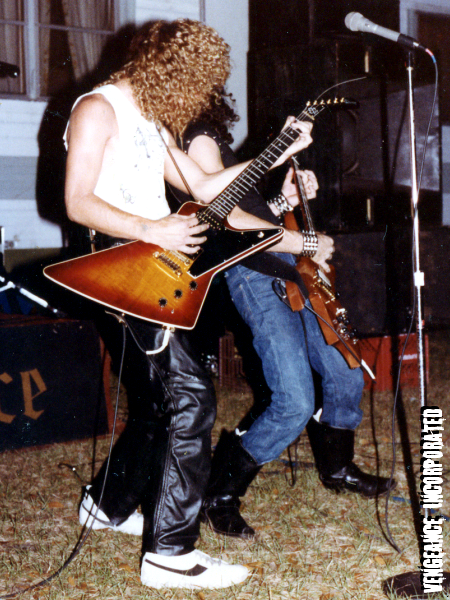 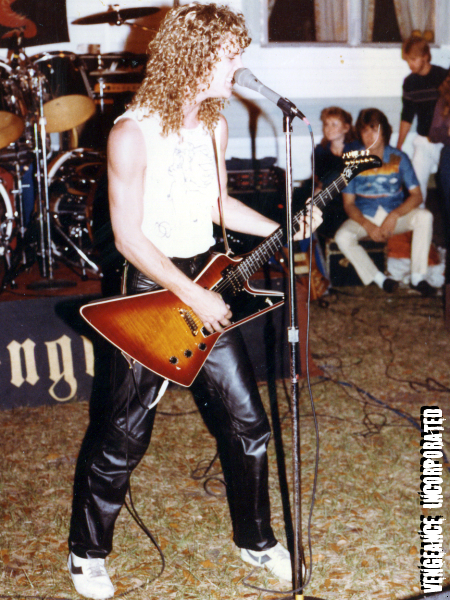 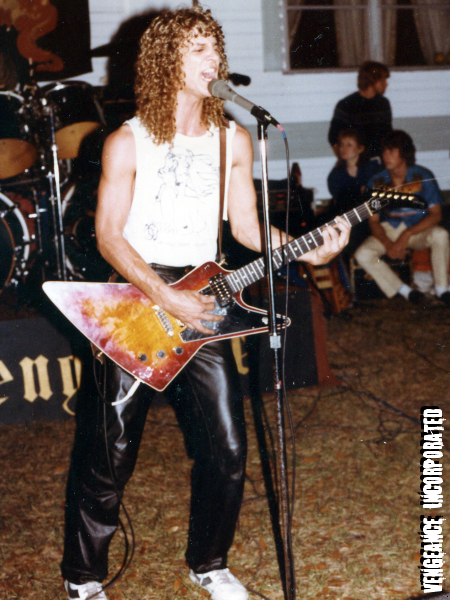 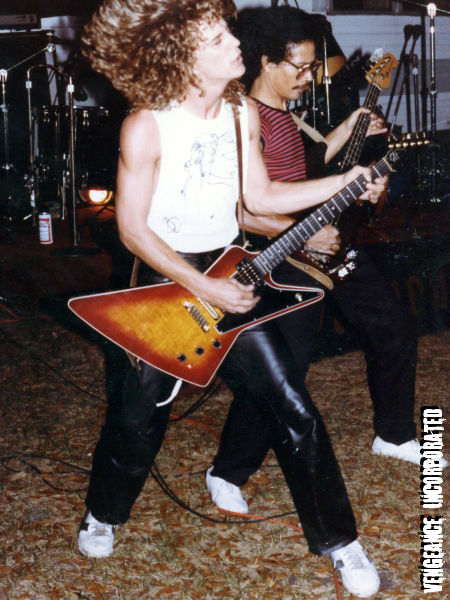 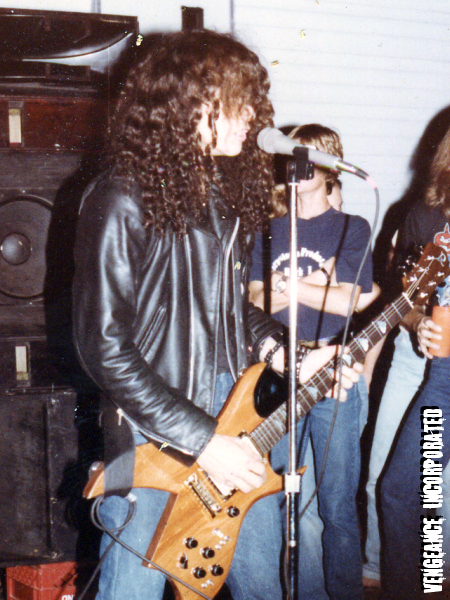 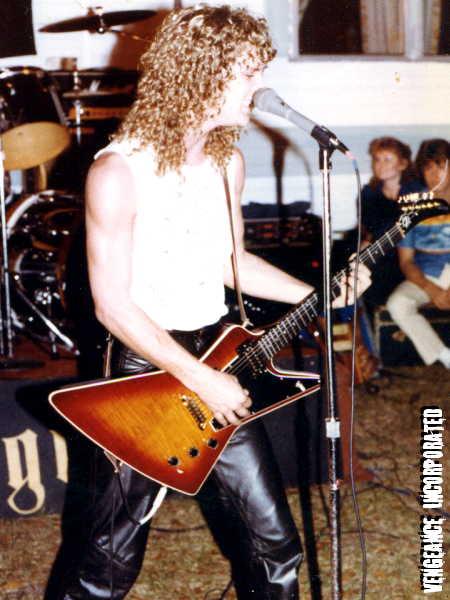 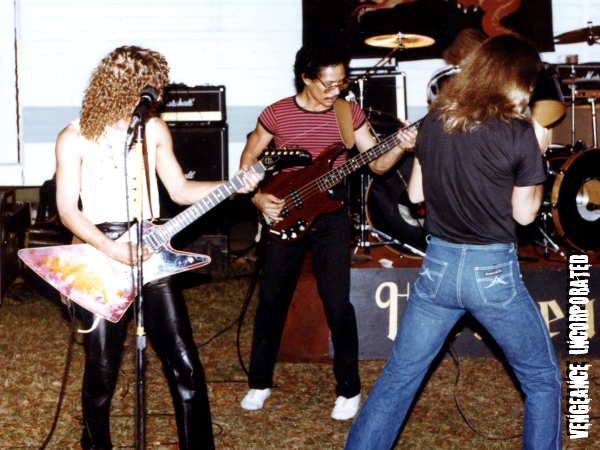 Mike had joined the Tampa band Brat after leaving Vengeance, but had been disillusioned by their constant vacillating between commercial and heavy music and ended up leaving. 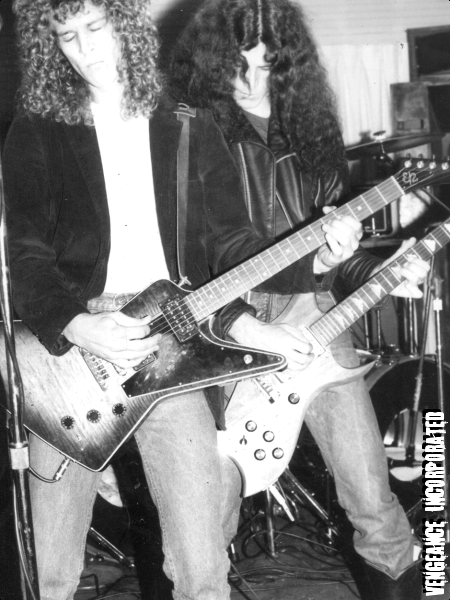 Ironically, right after Mike left Brat, David left Vengeance to join Brat for his own unsatisfying stint with them. 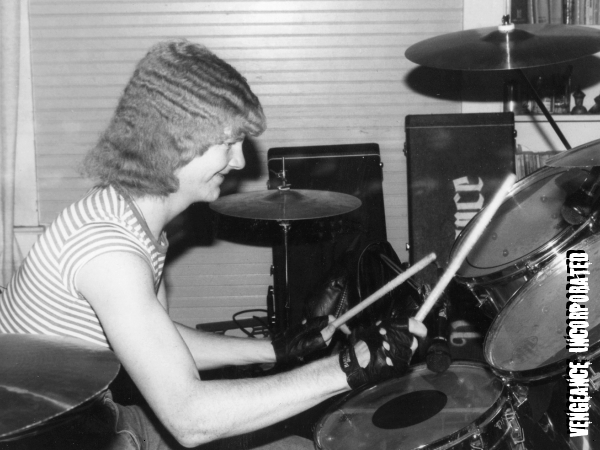 After what seemed like thousands of auditions, Chuck replaced David on drums. 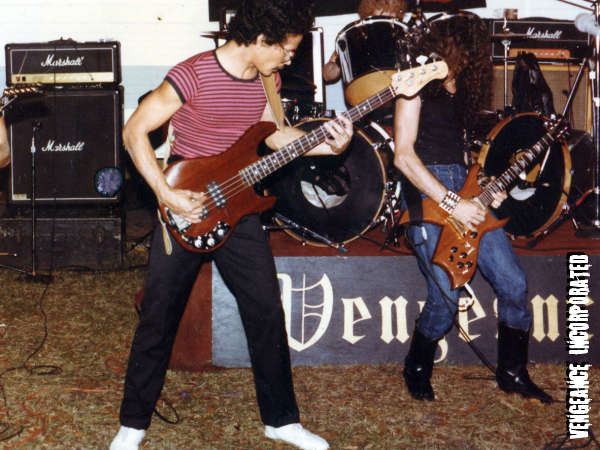 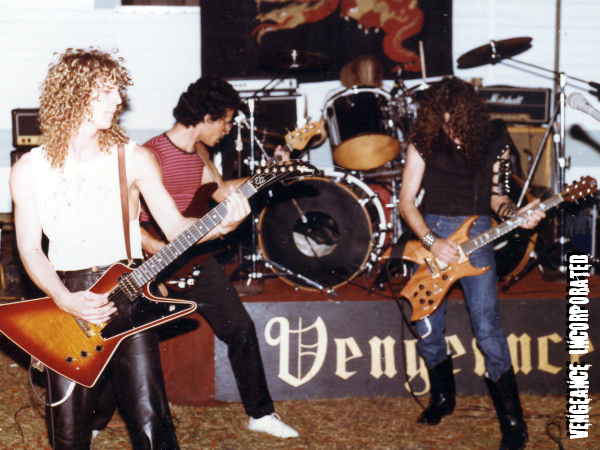 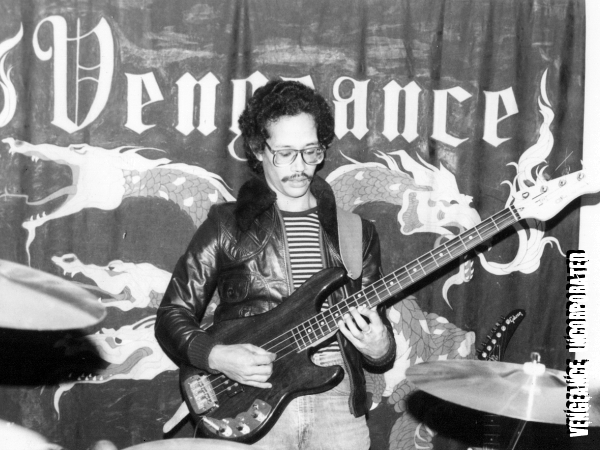 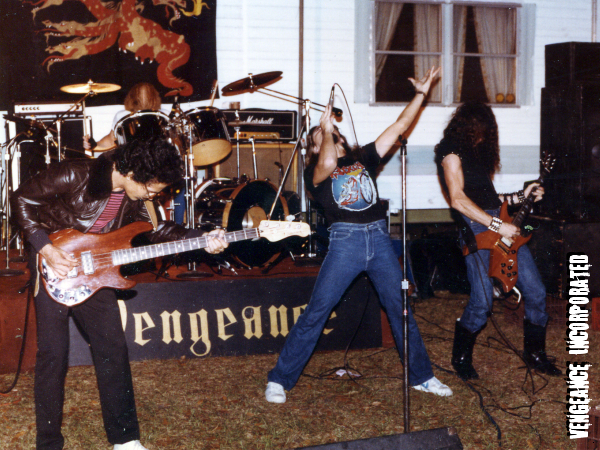 Vengeance started recording the basic tracks for Predator.